It didn't take the news-reading algos long to find what they were looking for in Jerome Powell's speech yesterday. And to his credit, the Fed Chairman didn't make it difficult for either the computers or mere mortal analysts to understand what he was trying to communicate. The bottom line here is simple. Powell & Co. do not have a preset path for future rate hikes and will be "data dependent" going forward. In other words, the fear that the Fed becoming stubborn, going too far, and hurting the economy in the process (the way they have in years past) is off the table. 'Nuf said. To the stock market, this meant that one of the three big worries has been removed. Traders - and their computers - noticed. Within 12 minutes of the release of Mr. Powell's speech, the S&P 500 surged 30 points. And by the end of the day, the trend-following algos had tacked on another 30+ points, putting the gain on the day at 61.62 points or 2.30%. For those that prefer the really big numbers, the Dow put up a gain of 617 points. Not bad. Not bad at all. I've been telling my advisor firm clients for some time now that there were a couple phrases that could turn the recent stock market correction around. First, I opined that if the Fed were to subtly signal that it would be "data dependent" in 2019, traders would breathe easier. And second, I suggested that stocks would certainly celebrate if the market got wind of a trade deal with China. First things first. The Fed Chairman said clearly that his gang of central bankers would indeed be "data dependent." Well, he actually said the following: "We will be paying very close attention to what incoming economic and financial data are telling us. As always, our decisions on monetary policy will be designed to keep the economy on track in light of the changing outlook for jobs and inflation." In case you aren't fluent in Fedspeak, that means the Fed will be "data dependent" going forward. What's more, Mr. Powell said that the Fed Funds Rate is now "just below" the all-important neutral zone. Also known to Fed officials as r*, the neutral rate is the point where monetary policy is neither restrictive nor stimulative. The question, of course, has been, just what does "neutral" mean? 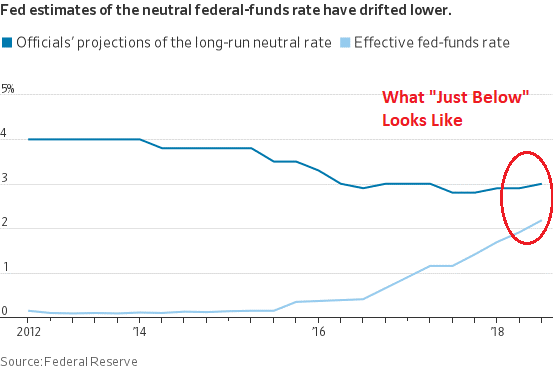 For months, analysts have speculated on the topic and the chart below shows what the Fed's view of "neutral" looks like. The dark blue line is the Fed's view of the long-run neutral rate. The light blue line is the actual Fed Funds rate. To be sure, the two lines are converging. This means that the Fed is getting close to being able to press the pause button on their rate hike campaign. And the sooner the Fed stops raising rates, the sooner businesses (and home buyers) can be comfortable with what their borrowing costs are going to be. Another aspect of this discussion is the fact that global growth is slowing and there are cracks forming in the foundation of the U.S. economic growth picture. Lest we forget, Germany and Japan have already reported negative GDP results for Q3 and this morning we got word that Switzerland's measure of economic growth slipped -0.2% for the quarter. Next, we can factor the recent dive in oil prices into the outlook for inflation. And given that much of the oil decline has been attributed to supply concerns, lower energy prices could certainly stick around for a while. The point is that the "neutral" target may need to be reduced at the coming Fed soirées. So, if the dark blue line on the chart above starts to roll over, the two lines could intersect sooner than expected. A good thing for stocks. Another important key to yesterday was a shift in what I like to call "Fed Expectations." I.E. What traders/analysts expect the Fed to do with rates going forward. 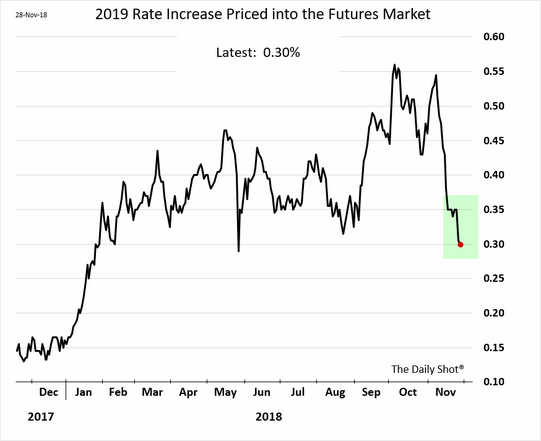 The point here is that the expectations for the number of rate hikes in 2019 is moving down. The chart below shows the total percentage gain for Fed Funds Rate expected in 2019 - as implied by the futures market. As you can see, this measure suggests that Fed Funds will rise by a total of 0.30% next year. Given that Powell's gang has been raising rates at a 0.25% clip, this points to just one rate hike in 2019 - which is about half of where the expectation was just a couple months ago. Finally, we need to recognize the impact this shift in Fed Expectations could have on the dollar. Recall that the recent rally in the dollar has been hurting companies doing business overseas and the emerging markets. The thinking is that if rates aren't going to continue to rise in the U.S., then according to my friend/colleague Mr. Jeff Pietsch, JD, CFA, of Eastsound Capital Advisors we are likely seeing "peak policy divergence" with regard to global monetary policy. In English, this means that rates in the U.S. won't be rising while rates around the rest of the world are falling. This should also mean less support for the U.S. dollar. Which, in turn, means an improved environment for companies doing business globally as well as the beleaguered emerging markets. Of course, all of the above is now yesterday's news. And the questions of the day appear to be: (1) Will we see a one-day "adjustment" to prices in response to Powell's commentary - or a longer-lasting move? And (2) will we get a deal - or even a hint regarding the likelihood of a deal with China over the weekend? My guess is that if the answers to the questions above are "no" and "yes" respectively, it will be time to back up the truck and buy stocks as at least a test of the recent highs would likely be in order. As of yesterday's close, a test of the highs on the S&P 500 would represent a 7.2% gain, which could occur pretty quickly. So... Be sure to keep an eye on the news over the weekend because this could get interesting.